Think it’s hard to go green when cleaning? It’s not! 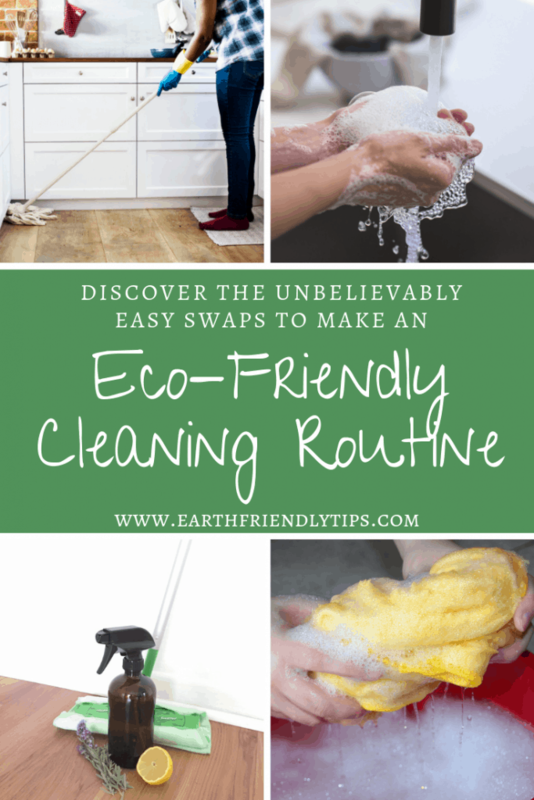 In fact, with five simple swaps you can create your own eco-friendly cleaning routine. Cleaning your home is important. However, between toxic cleaning chemicals that can hurt your family and the environment and the incredible amount of waste that’s generated from single-use cleaning products, you might be doing more harm than good each time you clean. Fortunately, you only have to make a few simple changes to your current cleaning routine to make it more eco-friendly. 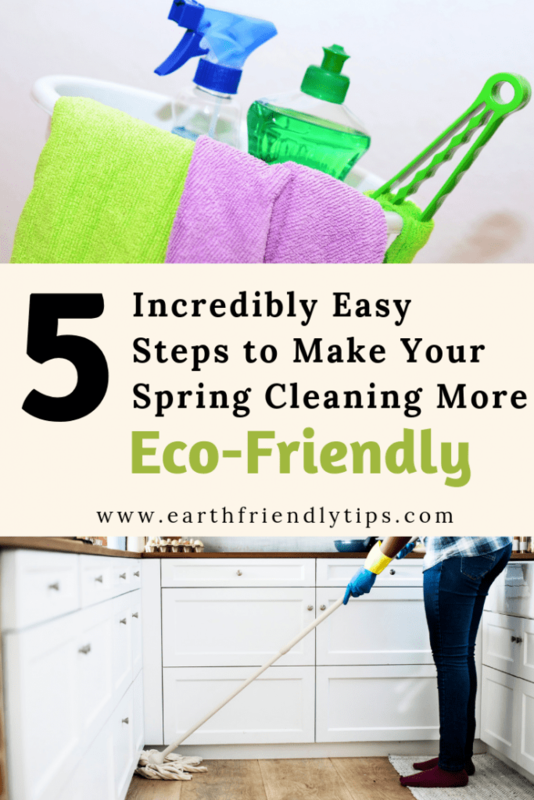 Read on to learn how easy it is to create an eco-friendly cleaning routine that will clean your home, reduce your waste, and protect your family and the environment from toxic chemicals. Obviously one of the most important changes to make when switching to an eco-friendly cleaning routine is to use natural cleaning products. Eco-friendly cleaning products offer several advantages over store-bought cleaning products. Natural cleaning products are easy to make, can save you money, are safer for your family, and won’t hurt the environment. If you’re not sure where to start, check out our DIY cleaning category for a complete list of the eco-friendly cleaning products you can make yourself. I have to hand it to Swiffer. The company has an incredible marketing department. They’ve convinced millions of people that their single-use mops and dusters are the best way to clean. I’ll admit I used to be one of those people. Every week I’d clean my floor with a disposable duster and mop pad. Then one day I stopped and realized what I was doing. At least once a week I was using a product one time, and then throwing it away. These products will take eons to breakdown and can leach harmful chemicals into the soil. That’s when I realized I needed to implement a more eco-friendly cleaning routine. Now I used a good, old-fashioned broom and dust pan to sweep my floors. Trust me, they work just as well as the disposable duster. I’d actually argue that they work better because they pick up small rocks, crumbs, and other items that the duster simply couldn’t get. Once I’m done sweeping my floors, I then put a microfiber cloth on my old Swiffer to mop them. I have laminate and tile in my home. So I use one microfiber cloth to clean my floors using this homemade laminate floor cleaner, and a different microfiber cloth and this homemade granite countertop cleaner that also works on tile. When I’m done, I simply toss the cloths into the laundry so they’re clean the next time I’m ready to use them. If you don’t have an old Swiffer mop you can repurpose into a reusable mop, get a floor mop that has a terry cloth cover you can throw in the washing machine when you’re done cleaning. Another quick and easy way to get rid of single-use cleaning items in your house is to make your own reusable disinfecting wipes. This helps you save money and eliminate disposable disinfecting wipes that are made with unsafe chemicals and create unnecessary waste. Here are a few statistics that will make you rethink reaching for that paper towel the next time you need to clean something. It takes 17 trees and 20,000 gallons of water to make one ton of paper towels, and in the United States alone over 3,000 tons of paper towels get thrown away EVERY DAY. 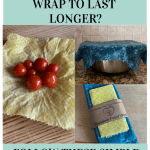 To make your cleaning routine more eco-friendly, swap those paper towels for reusable products. We’ve already talked about mopping with a microfiber cloth, and they’re also great for dusting and cleaning countertops. If you find they leave too much fuzz behind for your mirrors and windows, cotton rags are washable, reusable, and won’t leave lint behind. Don’t forget you can also make old towels, sheets, pillowcases, and T-shirts into rags. Ready to get the air in your home clean? Don’t reach for that can of air freshener. It might make the air smell good, but it also has a lot of health concerns. Air fresheners can contain phthalates and other hazardous chemicals that include formaldehyde, benzene, and solvents. Long-term exposure to these chemicals can cause damage to the kidneys, liver, lungs, and central nervous system. They can also alter the body’s hormones, which can cause reproductive problems and increase the risk of some types of cancers. Instead, there’s an easy way to clean the air in your house and remove some of those harmful chemicals: houseplants! Think you can’t keep a houseplant alive? Think again! These houseplants are almost impossible to kill and they’re air-purifying champions. The final step in creating an eco-friendly cleaning routine is selecting zero-waste cleaning tools. A galvanized steel bucket is going to last years longer than a breakable plastic bucket. It’s also strong, durable, and doesn’t absorb odors. Plus, if it eventually wears down, you can simply recycle it. If you need to do some scrubbing when you clean, get an eco-friendly scrub brush. 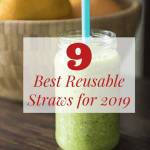 I prefer this particular model because its handle is made from sustainable bamboo and the bristles are recycled plastic. You’re not really cleaning your house if you’re using dangerous chemicals and producing unnecessary waste. If you’re interested in protecting your family and the environment, using these tips to create an eco-friendly cleaning routine will help. Want more eco-friendly living tips? Subscribe to our mailing list!